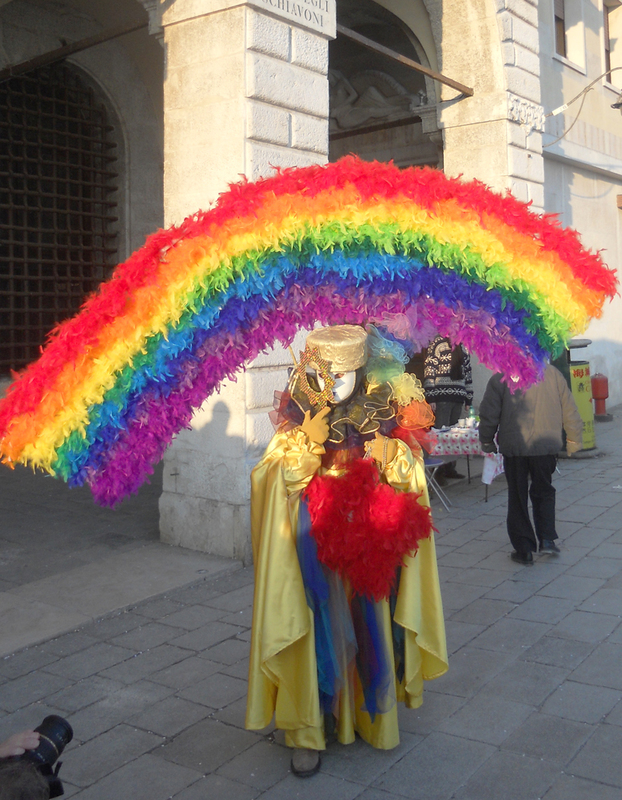 Venice I: What’s Carnival Really Like? What is Venice’s carnival actually like? Venice’s modern carnival is not a traditional folk and fertility festival. It does not have mummers and green men and pitchforks and man-women and ceremonial uses of straw and swords and alcohol (for that see a friend’s excellent post on a Basque Carnival). It is also not what it was in the Renaissance, an elaborate civic celebration-reversal, at which the rules of propriety were (witin limits) reversed, as the city displayed its wealth with gilded ships and gem-covered costumes, and paid vast sums to prominent artists to produce elaborate parade floats covered with mechanical universes and moving golden lions and actors dressed as confusing allegories. What it is now is a very grand tourist attraction at which an already overwhelmingly beautiful and alien city is suddenly populated by fantastical creatures and time travelers in elegant finery and three-cornered hats. 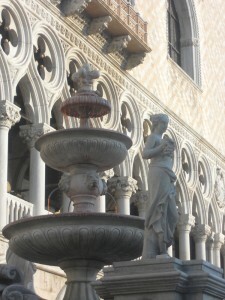 A Fountain by the Doge’s Palace flows with wine. Really. In Saint Mark’s square a not-very-well-engineered stage hosts mediocre entertainments, from ad hoc costume contests to poorly-microphoned musical acts. 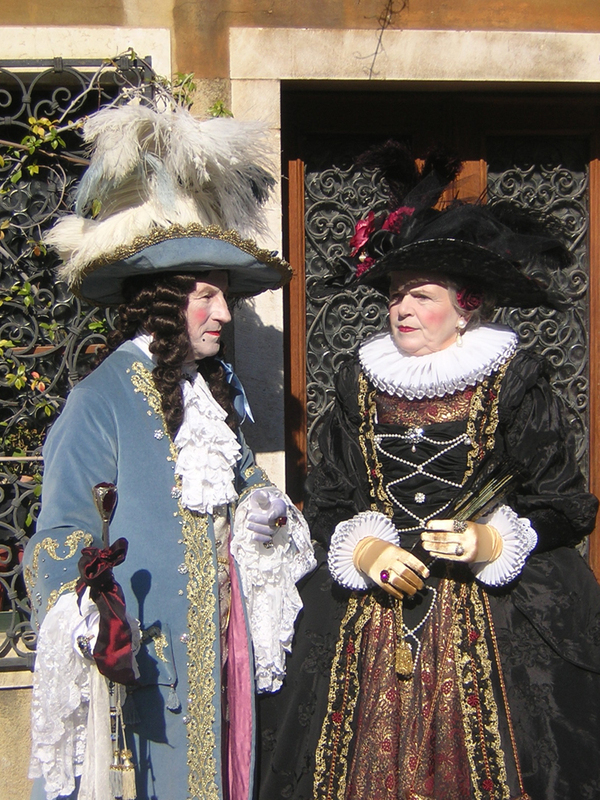 Behind the closed doors of expensive palaces-turned-hotel-restaurant-theater, people pay $200+ a head to attend grand pseudo-period fantasy banquets and masked balls. Venice’s year-round delights also remain: the gold mosaic Basilica of San Marco, the Doge’s palace, unique and world-class museums and galleries. All this is wonderful but unnecessary. As I promised the friends who joined me for Carnival this year (and as they can now cheerfully confirm) one does not need any activities or entertainments of any kind to have a blast at Carnival. One simply has to do one thing: get lost. 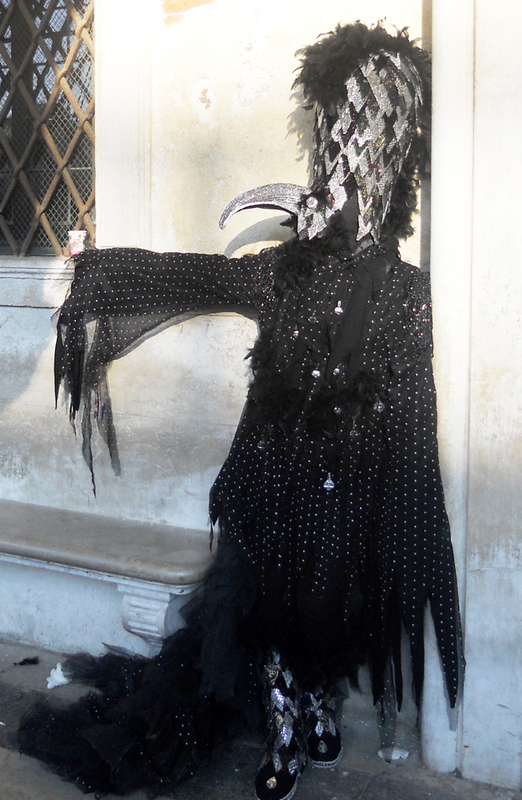 Even without its Carnival-only costumed population, Venice is eerily beautiful, and distant-feeling even when you’re there. If reaching Florence feels like stepping into a cross-section of the past, our ancestors’ world, not ours, Venice feels like a cross-section of the past of a different species. Everything is too delicate, ornamented with too many curves, too-elaborate windows, too colorful stonework, every surface a faerie facade. 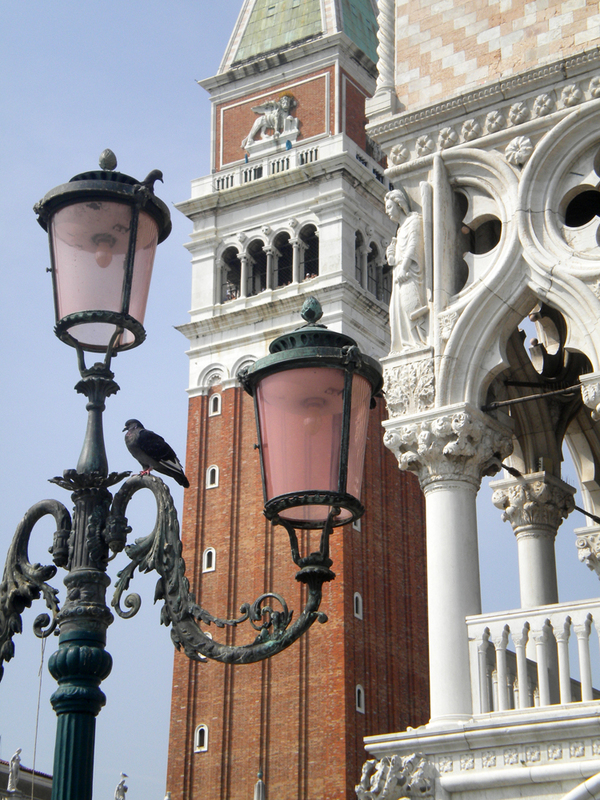 Many of the palaces (there are no non-palaces in Venice) are pink, even the blown glass street lamps pink, but you don’t even notice that it’s pink because the color itself doesn’t register as much as the fact that everything is just a hair more beautiful, calculated for ornament rather than defense or practicality. Where are the battlements? Where the ditches? Where the triangles of struggling grass between ill-laid streets? This is not a real city, it’s some kind of theater set, all ornament with all the practical parts left out. 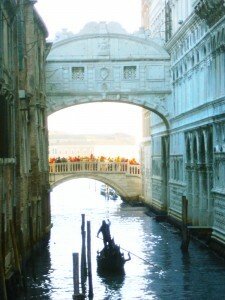 A main street in Venice. 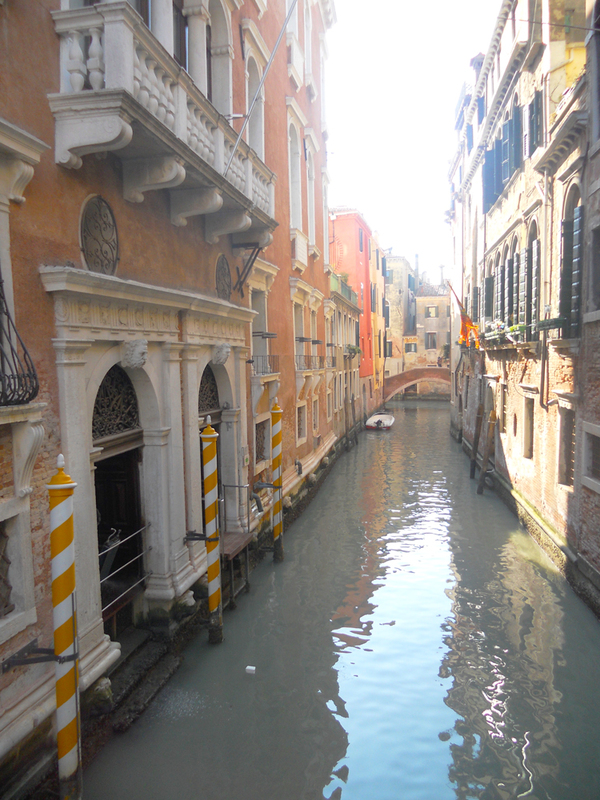 Venice is also a maze of twisty passages all unique, and the most difficult city to navigate that I have ever found. It isn’t just that it lacks a grid system, but that it lacks any main streets whatsoever and consists entirely of meandering alleys. After all, the main streets are canals, so you can’t walk on them – imagine navigating any other town without being allowed to ever go on any large street. In addition, no angle is 90°, no street is straight, no two points are connected by any kind of line, and a quarter of the streets are tunnels leading under palaces which have grown to cover them like a forest canopy uniting over an abandoned campsite. The streets are also incredibly narrow, so one can’t look up at an angle and see that a particular tower or landmark is That Way therefore That Way is East. The lack of 90° angles makes it very easy to get gradually turned around, and even people very good at navigating frequently end up thinking North is East and East South as a series of turns which seem to be heading consistently in one direction meander in another. Hence my summary: in Venice one is either (A) in Saint Mark’s Square, (B) on the Rialto bridge, or (C) lost. Standing on Rialto bridge, therefore not lost. It is, in fact, possible to navigate in Venice, but it requires a huge amount of concentration and constant map checking, so unless one has an appointment, why bother? Everything is equally beautiful. 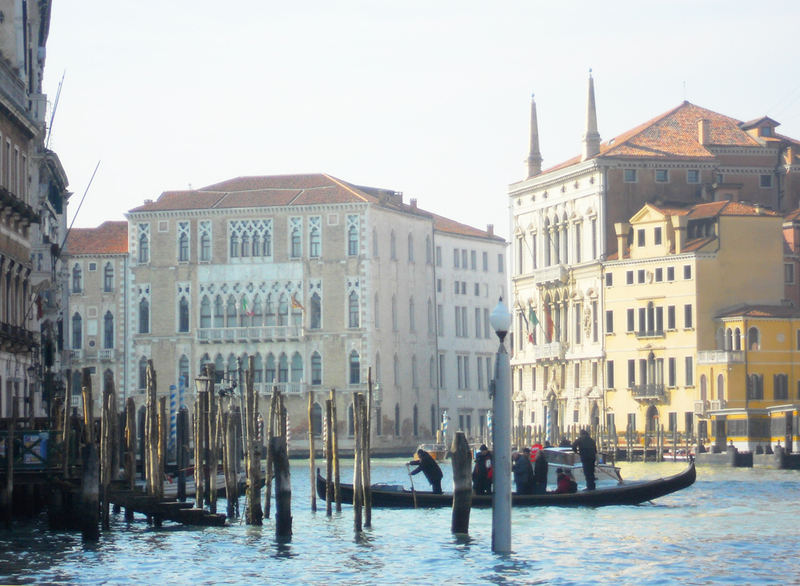 It’s an island; it’s not as if you can accidentally fall off the edge and wind up in Padua. Wherever you go there will be amazing palaces, intriguing mask shops, overpriced pizza, zillions and zillions of winged lions (Saint Mark, the symbol of the city) and you may as well turn left as right at any given point. It’s like the genius of Tom Sawyer’s Island at Disneyland, where joyful parents can sit down while kids run wild and wear themselves out on the self-contained plastic island which it is impossible for an unaccompanied child to escape. While on this island, everything is fine. 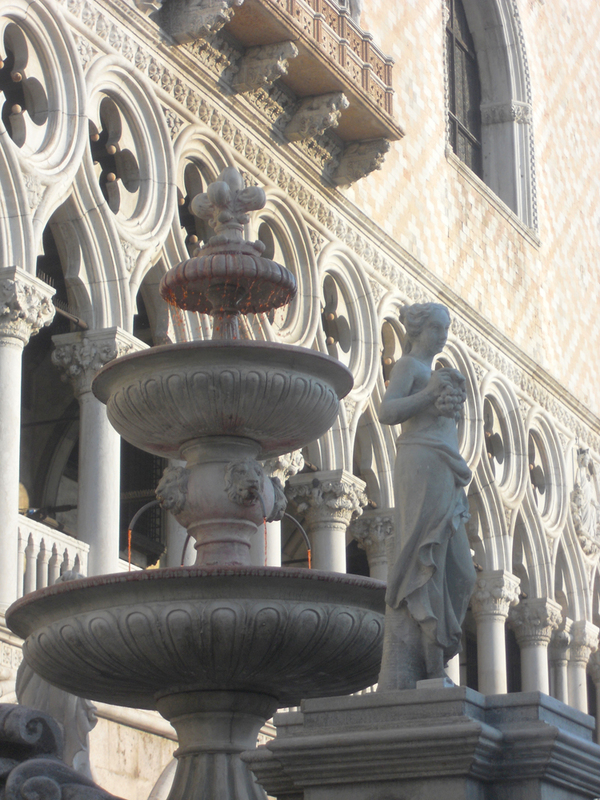 The city is filled, furthermore, with signs pointing to either San Marco or the Rialto, so, wherever you are, you can find one of these two points and, from it, take the water shuttle to where you need to be. 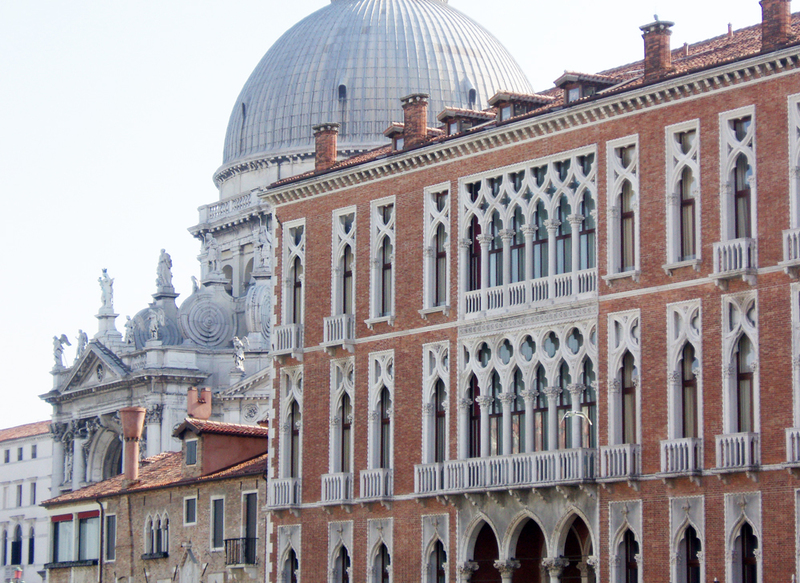 In fact, I highly recommend finding a hotel as close as possible to Saint Mark’s square (here is my preferred), since then magically Venice is filled with signs directing you home. Often, of course, a square will have two signs pointing to San Marco in completely different directions; both are correct, because there is no straight line, not in Venice. Time flies incredibly when one is wandering from alley to alley through an alien wonderland, and no further planned activity is necessary. Venice cycles through many repeated shops, selling the same mass-produced tourist items which are still worth getting, for the most part, since they’re really nice mass-produced tourist items: velvet pouches and purses, masks, lace, beautiful glass work, masks, silk and satin draperies, masks, art prints, masks, beads, masks, and also masks. During Carnival masks appear even in the shops that don’t sell masks, and every restaurant and hotel hangs up a few of these mandatory proofs that one is not a stick-in-the-mud. Between these and the costumes, the days vanish, an afternoon seeming an hour, as one wanders and wanders and simply wanders. When footsore, one hops on the water bus and rides around the city circumference or along the grand canal, where the most elaborate palace facades face, since, after all, water, not land, is the intended approach to these grand houses. It is worth mentioning that on the last weekend there is usually something quite spectacular in Saint Mark’s Square (a fire show when I went, with dancers with flaming spears, and a huge dragon puppet that they set on fire) but apart from that, none of the public entertainments are generally as exciting as the city itself. 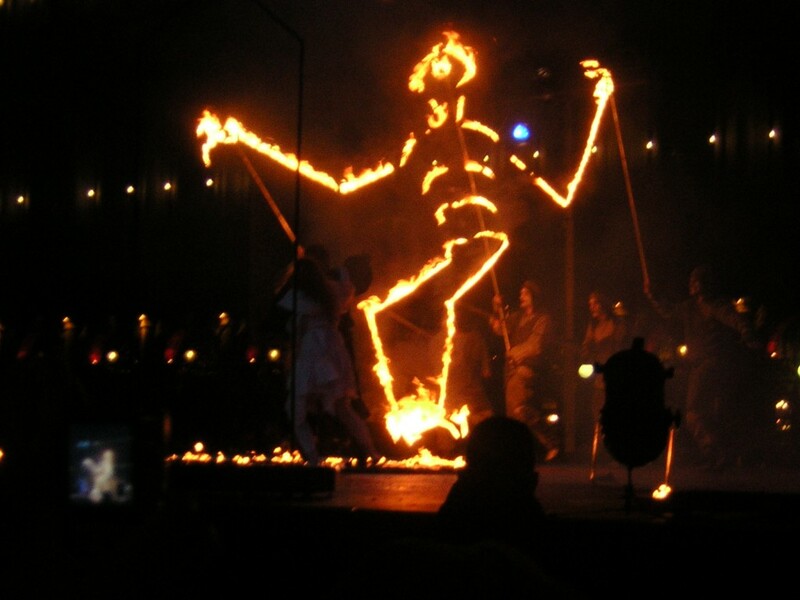 A flaming cyclops at the Carnival finale. 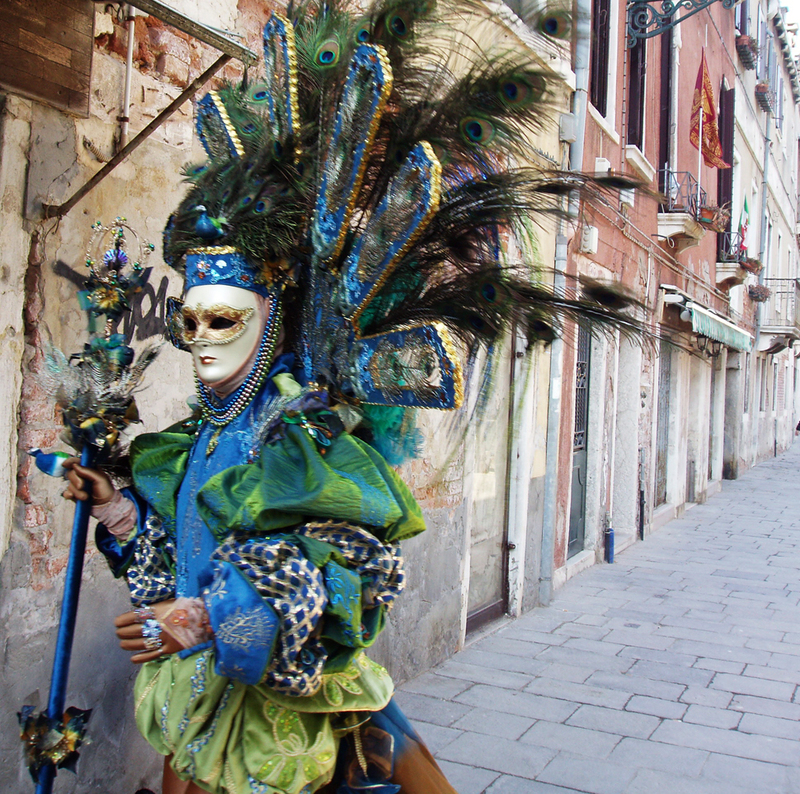 There are four categories of costumes seen on the streets at Venice’s contemporary carnival. The first are extremely elaborate, colorful fantasy pieces with full-face masks in bold, overwhelming colors and luxurious fabrics, many period but some modern, designed to create the most visually striking thing a human being can still arguably stand up in. Some are home-made, many rented. Most commonly one sees couples, pairs, one male one female, intended to be worn together, but sometimes solos and sometimes larger groups. Such costumes completely restrict one’s ability to do anything, including eat, talk, see more than a tunnel in front of you, and also doom you to the mercy of temperature, and walking too becomes a challenge. For this reason, these costumes cluster around San Marco square, where they stand to be seen and photographed, and one can spend happy hours in the square going from group to group and enjoying the ingenious whimsy of the tailor’s art. The average alley in Venice is about 4 feet wide. This person will be here all day. The Eighteenth Century: when pink was still a manly color. 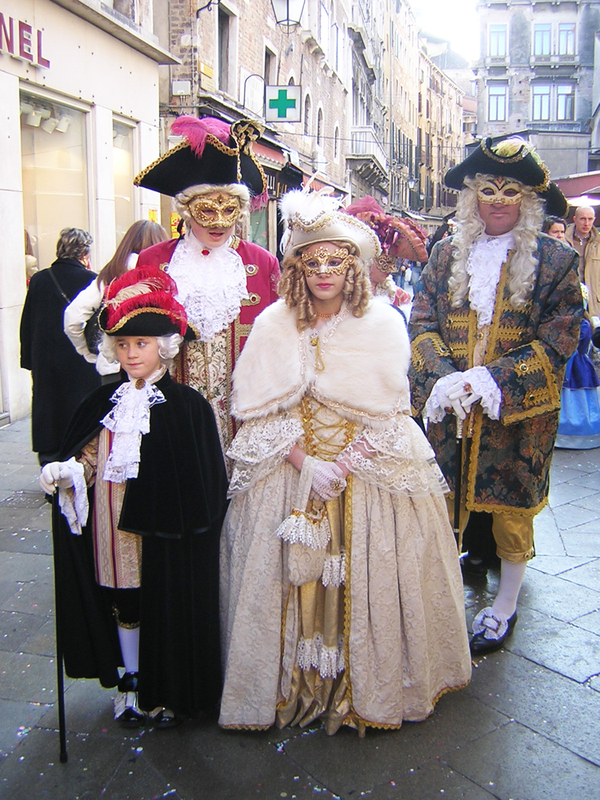 These costumes tend to imitate the period of the peak of the carnival’s opulence and fame, which was not, in fact, in the Renaissance proper, but in the Eighteenth Century, so the costumes one sees are mainly Eighteenth Century. This means for gentlemen long waistcoats, lacy cuffs and cravats or jabots, tricorne hats, coats with vast pleated tails, richly worked brocades, white powdered wigs, heavy walking sticks, and the kind of leather shoes with buckles or bows that one associates in US culture with the founding fathers. 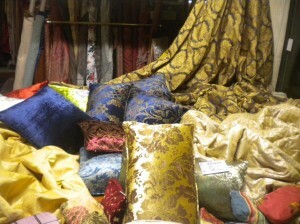 For ladies, the brocades are even more richly worked, the sleeves usually elbow-length with lace dripping to the wrists, the bodices taut and square with the lacing hidden, the skirts wide, not with circular hoops but with panniers which extend the skirts far out to each side (trivia of the moment, the word derives from baskets hung on either side of a donkey), and the wigs tall with clusters of bizarre objects like feathers and scarves and gems and seashells and toy boats woven into them in what should look like birds’ nests but do manage to register to the mind as hats. 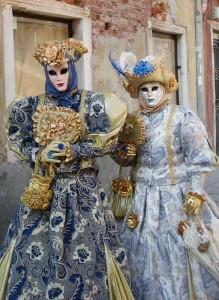 Such costumes are worn sometimes with beautiful but practical half-masks, and sometimes without. Venice: where ladies in hoop skirts go to take pictures of ladies in hoop skirts. Third come irregular historical and whimsical pieces. Someone always dresses as the Doge. Other historical figures like Dante or Galileo may crop up. 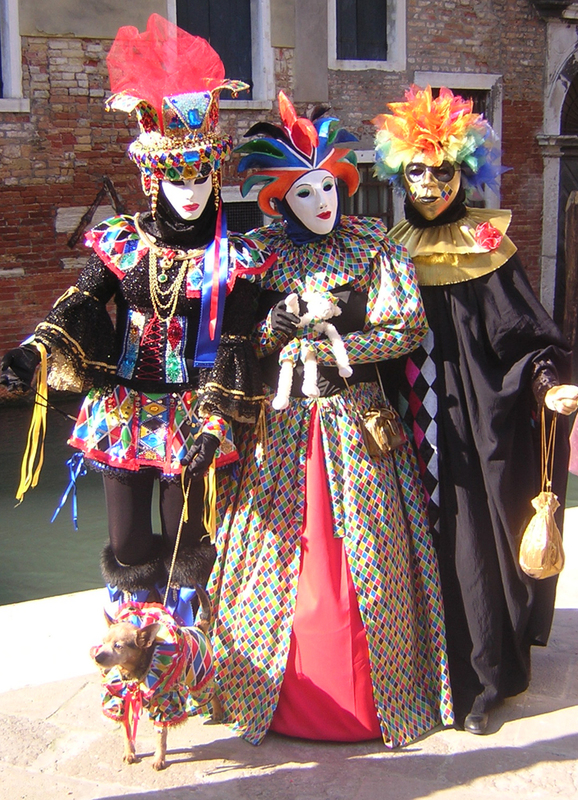 Some adopt characters from the Commedia dell’Arte, so Pulcinella, Harlequin, others generic 13th or 14th or 15th or 16th or 17th or 19th Century dress. Into this category then creep more marginal costumes: women in leather bodices and not much else, girls in Renn Fest gear, the odd Naruto or other anime creature, and young people with pink hair and neon green tail coats with sparkly skulls embroidered on them and platform shoes that light up. Why not? Only the Doge can have the Doge Hat. It’s the Best Hat. Tolkein’s Elves put in an appearance. Dramatically posing gothic silver crystal scale bird plague thing? And last, there are little kids in the kind of cheap costumes as clowns or faeries or witches or batman that one buys mass-produced, just like at Halloween. By my estimate 15% of the Carnival attendees are in costume. 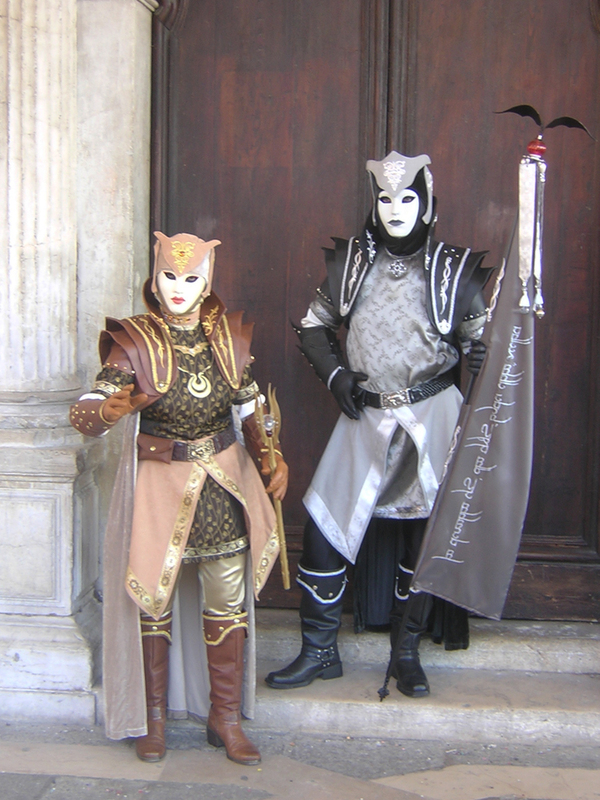 Another 20% are just in masks, which they buy mostly on arrival to get into the spirit of the thing, and a further 15% succumb to the desire for costume enough to buy a cloak and/or hat to wear over coat and jeans. 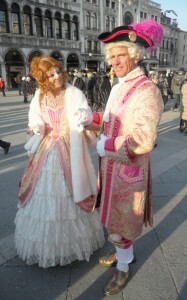 Of those in fancy costume almost all are foreigners, mainly anglophone. Of those just in masks, 50% may be Italian. 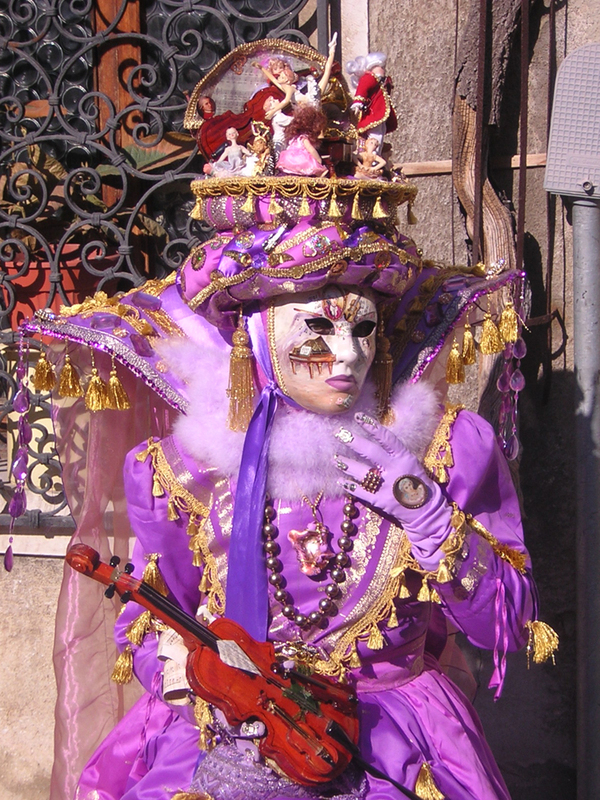 Keep in mind that Venice’s tourist population outnumbers its native population at least 3:1 at all times, moreso at Carnival, and that its separate population of resident foreign college students, also substantially anglophone, also outnumbers the native population not quite 2:1, making Venetians less than 20% of the people on the streets. 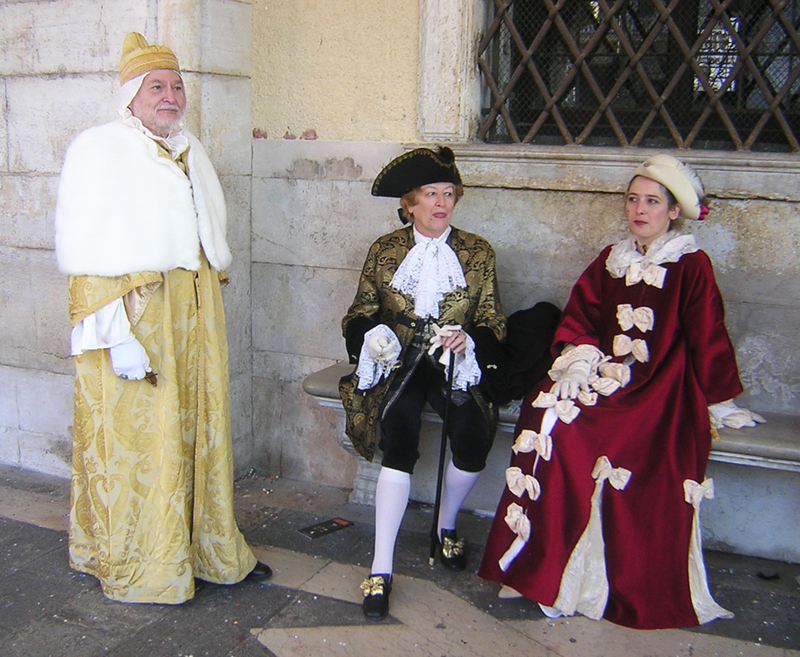 In fact, there are only 20,000 Venetians and something well over 100,000 outsiders at any given time, and most of the Venetians, for real estate price reasons, have retreated to living on the shore anyway. A hotel or shop simply makes so much money that it is very difficult to turn that down in favor of a residence. 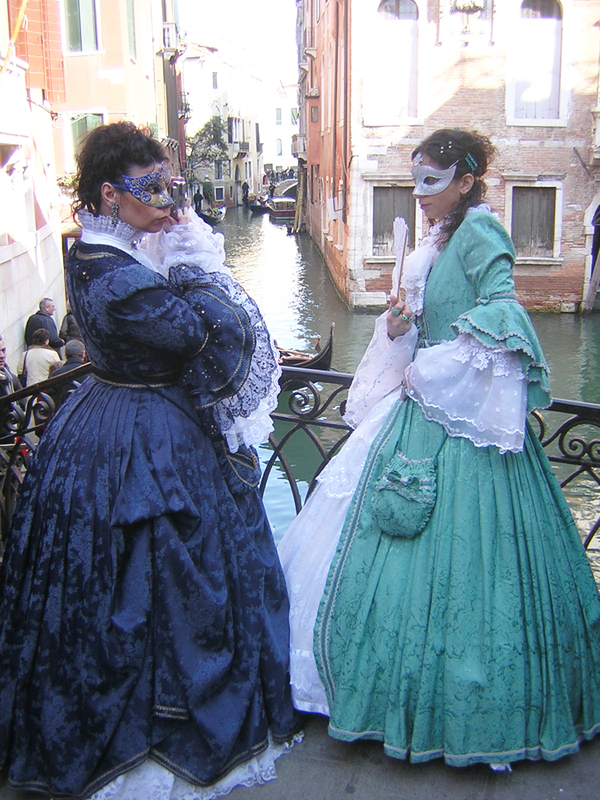 It is for this reason that it’s not rare to find someone who both identifies as Venetian and grew up in Padua. 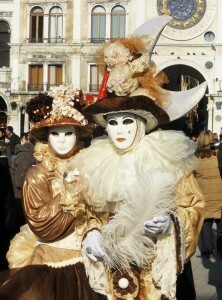 Venice at Carnival is also incredibly crowded. This year I went in the middle of a deadly cold snap, and it was simply very crowded. In good weather it is so crowded that one can barely walk through the streets. At one point I literally encountered deadlocked foot traffic, an intersection at which so many people were shoving in from all 4 directions that it became physically jammed with bodies and was impossible to move, and the poor people in the center were literally trapped and unable to escape – after fully 30 minutes of shoving I gave up and went back the way I came. 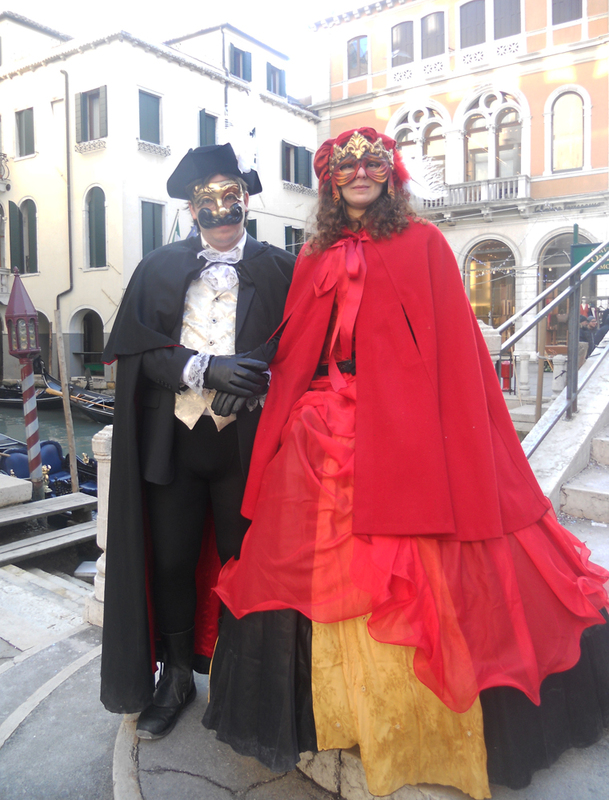 The question of whether one wants to go to Venice for Carnival thus comes down to how fun one thinks it is to see the city populated with fantastic creatures in among the masses. Venice is always beautiful, the canals always serene, the sunsets always stunning, the mask shops always open, a simple ride around and around on the water bus always perfect. During Carnival prices go up, hotels fill, restaurants run out of tables, streets are crammed with people, attendants outside monuments get more fed-up and rude, but in the streets one catches little dream-like glimpses Doges, and Counts and dramatic cloaked figures, and mysterious masked ladies, and fantastic creatures from the historic other-race that instinct tells you built this miracle city. For me, it’s a fair trade. 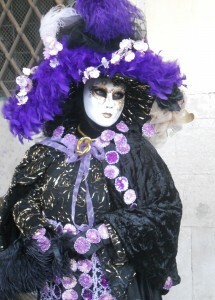 Read more about Venice’s Mask Culture. Grazie for this wonderful post. 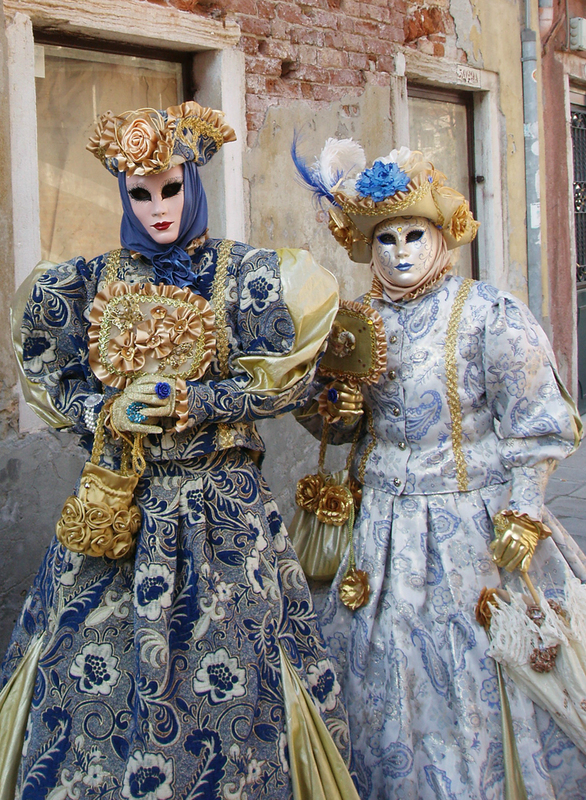 I will be going to Carnival in Venice for the first time in 2013, a ‘bucket list’ thing. Fell in love with the city in 1999 and always dreamed of going back for Carnival. Taking my camera, my costume, plus lots of Mardi Gras beads (from LA), and best friend for an amazing experience….hope, pray and pray some more. Thank you for all the info.